In the previous blog, we started to look at the two sides of our lives, professional and personal. We defined that you are more likely to hit your personal and professional goals, despite having very little choice when compared to your professional life. We began to examine the role of policies and procedures in the workplace and posed the hypothetical situation of implementing a policies and procedures manual in your personal life. If you haven’t read the previous blog, I highly recommend you do so. You can find it here. So you pick your team but not your family, yet you hit your personal goals and not your professional goals. What’s up with that? Most companies begin their yearly planning with growth strategies and objectives to achieve throughout the year. They allocate budgets and hire people they feel capable of executing the tasks. The people they hire are hand-selected from a field of applicants and usually subjected to an interview where their qualifications and abilities are gauged. Once you’ve decided that you want the person on your team, you make them an offer of employment, which they accept. You reward them with a book of policies and procedures that outline when they can take time off, what to do if they’re sick and how to dress while at work. Do you think all the strongly worded warnings in the book will inspire their creativity? 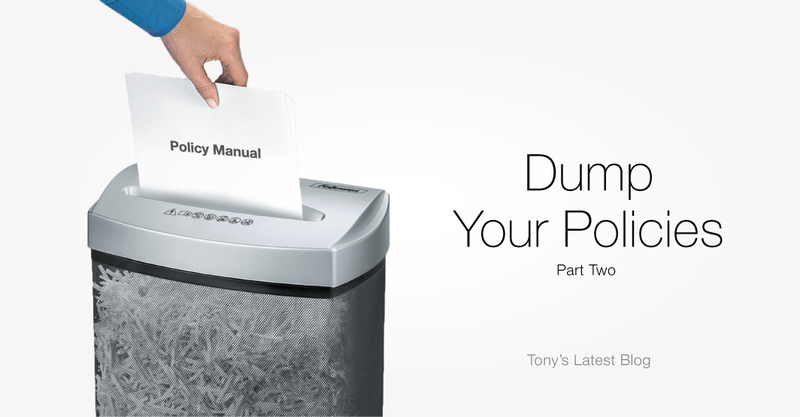 Remember that you don’t have a policies and procedures manual at home, yet you’re still hitting your goals. Why is that? Well, do you trust your Mom? Do you trust her because while raising you, she followed all the rules in the manual your father or her own mother gave her? No, there were no rules and you turned out great! Do you trust your partner? How about your child? Of course you do and you do it without a manual outlining what they can or cannot do. Nothing says I don’t trust you like a book filled with rules that is to be strictly followed. Imagine if in your professional life, you only welcomed people onto your team that you trusted. It will require you to be a bold leader and to truly give trust to those you barely know but guess what? You chose them! If you can’t trust them, then why did you choose them? What is it about your leadership that prevents you from trusting those around you or finding people worthy of your trust? We ditched our dress code policy a couple of years ago and it was a great decision. We trust that you are going to represent our company properly based on the core values of our company. We trust you. That is our dress code policy. We hired you, we picked you and quite frankly we wouldn’t pick someone who has no clue how to dress at work. If we did, then that’s on us, the leadership team. Since we’ve gone to a “we trust you” dress code policy we haven’t had a single issue. Yet when we had a robust policy indicating what was and what wasn’t appropriate, we had tons. Trust is vital. You trust your family and that’s why you don’t have a policies and procedures manual. That’s why you’ve never turned to your partner after they filled the car with gas fresh from dropping your children off at soccer and asked them to produce a receipt. You trust that everyone in your family is working towards your common goal. The system is working because you keep hitting greater and greater goals. Good for you! At the core, if you have the right people in your professional life, you don’t need extensive polices – and it starts with the leaders. Here’s the thing, weak leaders hide behind polices. They don’t use bold leadership, they use polices and procedures to cover their butts. Policies and procedures are the number one office creativity killers! In addition to being a fortress for weak leaders to hide behind, policies and procedures strip away all the fun and passion from the development process. While your team should be thinking about how to solve a challenge or execute a project, your policies and procedures prevent them from truly being innovative. You can’t tell your team to think outside the box and then tell them to do it by the book (in this case your policy manual). 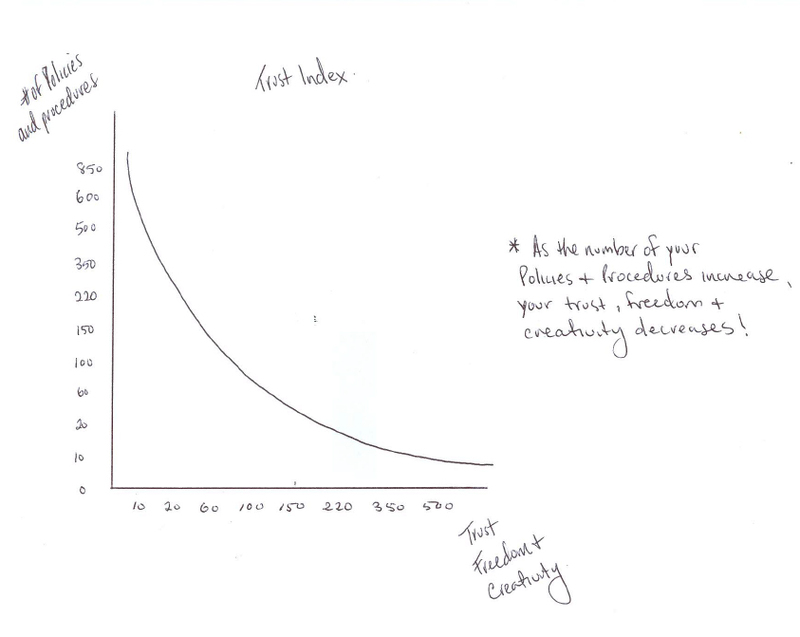 Your trust will lead to freedom, that freedom will foster creativity and creativity will produce extraordinary results! 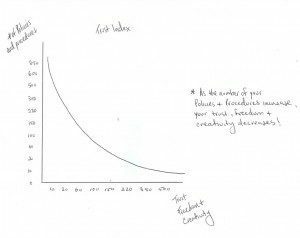 A hand-drawn graph by Tony Gareri shows the relationship between policies and creativity. A weak leader hires someone to fill a vacant role: an urgent need within the organization but they don’t trust the person or their decision 100 percent. They think to themselves, “Even though I don’t trust them, I have polices to ensure they follow my rules.” A few months later, the person messes up and the leader points to a policy that allows your company to easily dismiss the person. How much further ahead are you now? How about this: hire someone you trust and let them go to it. Recently, our video samurai came to me and asked to set up a meeting regarding a video project he had. I said sure and set up a meeting with him. He confessed that this would be a little different because no one has ever bestowed that much professional trust in him. He understood two things from our exchange. One was that he was trusted and the other was that he had to over deliver with the project. I wanted him to deliver the best video he ever has and trusted that he would. I could have given him a bunch of requirements or guidelines and he could have delivered the requested video. But where’s the passion in that? Where’s the trust? I know he’s the right person, he’s ultra talented and I picked him to be part of our team after all. Turns out he created something pretty special and I invite you to view the video embedded in this blog (please let us know what you think). As the CEO, I have a great group of people that report directly to me. We both chose to work together and I trust those people unequivocally. They in turn, have people that report to them. I can go policy-less with my group but can my leaders go policy-less with theirs? One leader says, I can do it with most of my team but I don’t think it would work with Sally. Ok, let me get this straight, you don’t trust Sally but expect her to help you Move, Inspire and WOW our partners? The issue isn’t the policy it’s the leadership. The size of your policies and procedures manual is directly related to the amount of innovation your company is capable of producing. If you want the sky to be the limit, then make it. Remember we don’t have a policy with the sun that ensures it will rise every morning. We just trust it will. Yet there it is, everyday pushing the limits of the sky. Give this a try: Dump your policies and create guidelines that foster creativity that aligns with your company’s core values! Nice graph! And awesome blog! When you are trusted, you feel a huge sense of responsibility and don’t want to let the person down! Leadership via Trust is a game changer and it’s refreshing to see leaders lead that way! Great job! I think it’s that moment between hearing, “I trust you,” and the moment it sinks into your head that is truly powerful. It’s a sense of entitlement to open up that well closed box in our brains where we keep the best of ourselves…usually to be opened when we’re having the most fun. Being trusted in the workplace really does encourage us to always strive to do our best. Having worked for “the other guys” in the past where your days were ruled by policies, I can truly tell you that this environment is really refreshing! Love the Blog, Tony! More companies should adopt this. To be trusted is a gift, I do not take it for granted! I believe it makes an individual work that much harder, making not only themselves proud of a job well done, but also their Leaders. Thank you to ALL of my Leaders! “The best way to find out you can trust someone is to trust them.” – Ernest Hemingway. My favorite blog yet! Trust…that is a big word within the world we live in. This word is thrown around sometimes with little regard to the power it holds. Roma gets how big that word is and we as a team rise up to it every day! Great blog Tony. A very interesting message and an excellent read. Thanks for sharing! Trust is the foundation of all relationships, both professionally and in business. It’s great knowing that we work for a company with TRUST as a foundation!!! Well said Tony, this says it all. Amazing! Revolutionary!! Such a simple process yet so profound! Would be absolutely incredible if other companies would adopt this – TRUST is the key element to drive the RIGHT people to new heights! Amazing! Keep being a stand for what’s possible in the world of work Roma Moulding! Push the boundaries to new heights! Awesome work! !